Of course, the really big news came from Madrid, where in stoppage time of Barcelona’s away win over Atlético, the home side’s Czech defender Tomáš Ujfaluši, frustrated by seeing his team finally beaten by opponents they’ve generally had the better of in recent seasons (Barcelona only lost one match in La Liga last season, and it was against Atlético), put in a horrible challenge on Lionel Messi. In spite of the fact he wasn’t even looking at the ball, Ujfaluši has since claimed it was accidental. At any rate, Messi – who apparently has bones in his lower leg which are composed of some super-strong form of diamond – will be out for two whole weeks with a sprained ankle. Oh – La Pulga had earlier scored a goal, and Barcelona won 2-1. Elsewhere in Spain, Ángel Di María opened the scoring for Real Madrid, who in spite of playing poorly beat Real Sociedad 2-1 away. The other injury alluded to above came in Uruguay, where Marcelo Gallardo was making his first start for Nacional on Sunday at home to Bella Vista. The match had started with an emotional tribute to Diego Rodríguez, the 21-year-old Nacional player who died of injuries sustained in a car crash last week. 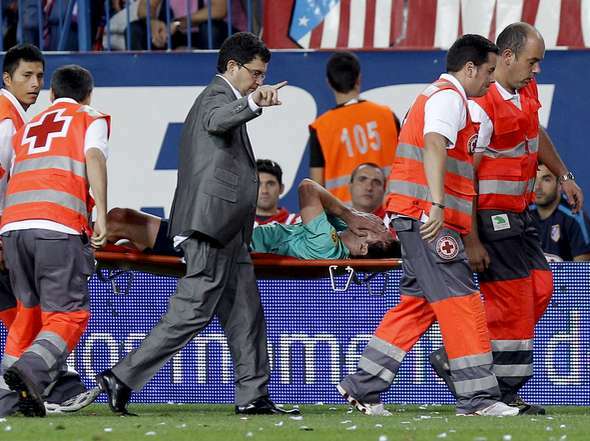 Gallardo’s diagnosis is a ruptured tendon, which will require at least 45 days of rest to recover, and which is likely to rule El Muñeco out of playing for the rest of 2010. Nacional won the match 1-0. In Italy, Cameroonian striker Samuel Eto’o struck twice to give Internazionale a 2-1 win away to Palermo – Palermo’s first home defeat since March 2009, when they lost 4-0 to Catania – but the big Argentine news was that Javier Zanetti, who took a heavy hit from the ball to his chest during the game, had to be rushed to hospital afterwards with chest pains on the right-hand side of his chest. The initial fears went as far as suggesting a heart attack, but according to Esteban Cambiasso, who spoke to Sky Italia later, ‘we were a bit worried, but it turns out he’s fine, and we’ll all be returning together to Milan.’ Pastore, for his part, played very well for the hosts, whilst Walter Samuel, Cambiasso and Diego Milito all started for Inter along with Zanetti. On Sunday, former Boca midfielder Cristian Ledesma scored the equaliser for Lazio who came from behind to beat Fiorentina 2-1 away from home. In England, the only Argentine goalscorer was Carlos Tevez, who lobbed the goalkeeper to open the scoring for Manchester City as they beat Wigan Athletic 2-0 away. For the visitors, Franco Di Santo got a start at centre forward ahead of his countryman Mauro Boselli, who after initially struggling somewhat to settle in was an unused substitute. The Dutch Eredivisie saw Sergio Romero’s return between the sticks for AZ Alkmaar for the first time in six months. In spite of being the selección’s first choice goalkeeper, Romero hasn’t featured for AZ for six months (in fact his last appearance for them had been six months ago today, on the 21st March away to Sparta Rotterdam), but returned to the starting lineup on Sunday as they beat NEC Nijmegan 1-0 away. In Mexico, the headline Argentine performer was Emanuel Villa, who opened the scoring for Cruz Azul as they beat Querétaro comfortably, 3-0. Maxi Biancucchi – who bears the cross of being Lionel Messi’s cousin – also scored for Cruz Azul. Christian Giménez started for them. In the dugouts, Pablo Marini took charge of his first match at Pachuca manager, but lost 1-0 away to San Luis. Benfica’s Argentine contingent numbered two in the starting XI for their derby with Sporting CP, and neither Pablo Aimar nor Javier Saviola lasted the full 90. Aimar, who has carved himself an edifying niche as an elegant playmaker for the Eagles, was withdrawn at half time with a suspected knee injury. He was absent from training on Monday and is expected to miss Saturday’s trip to Marítimo. Saviola was his usual energetic self, working well in support of Paraguay’s former Newell’s striker Óscar Cardozo, but was unable to get onto the scoresheet. He was withdrawn after 80 minutes. Summer signing Franco Jara also saw some action, but the former Arsenal man was only given 5 minutes on the pitch by Jorge Jesus, and made little impact on the game. Sporting’s centre-back Marco Torsiglieri was an unused substitute on Sunday, but deserves an honourable mention for his contribution to Sporting’s 2-1 away victory over Lille in the Europa League last Thursday. Making his first start, the former Vélez stopper was an assured presence in Sporting’s three-man defence, impressing with his composure and confidence in striding beyond the halfway line to join the attack. Monday’s game saw FC Porto travel to Nacional, and another decent performance from Fernando Belluschi, who struggled to adapt to the Portuguese game last season following his move from Olympiakos. The midfielder was booked for a clear dive, but not before delivering the ball that caused João Aurélio to head beyond his own keeper to give Porto the lead. After an underwhelming debut season, the Newell’s youth product looks set to be a key man for Porto in 2010/11. Thanks to Ben for that, and if you’re reading this and would like to contribute on a league of your own choosing, please get in touch at the normal address (check the ‘Contact’ page under ‘About’ in the header if you’re not sure of that). I’ve already got Portugal, Mexico and Australia covered, and I myself will probably keep an eye on England and Spain, but all others are open to offers. Great stuff ! I love to read about all the local fellows wherever they may be. As for Cristian Ledesma, sort of ex-Boca. He never played with the big team. And, kudos to Neri Cardozo, ex-Boca, who is playing well for Monterrey in Mexico. I see there is a rumor that James Rodriguez could return to Argentina from Porto, and sign up with Racing. I can hear Seba smacking his lips ! Where did you see that Johnny? I’d be surprised if Porto let him go back to Argentina so quickly, he hasn’t played yet but they’ve been integrating him with the first team squad for most of their matches. IN ISRAEL’S THE TOTO CUP (A PRIZE MONEY CUP RUN BY THE GOVERNMENT OWEN SPORT BETTING AGENCY), Ignacio Canuto played 90 minutes for Macabi Haifa in their loss 2-3 to their northern neighbor, Hapoel Acco. Meanwhile, Pedro Glaban had a better game for Beni Yehudi Tel Aviv, returning from absence to hit the cross bar from a free kick. His team beat Hapoel Petach-Tikvah 3-2. Thanks for this, TBF. Would you be interested in emailing me a piece on Israel each Monday, so I can include it in the actual post? I’d be happy to link to your blog and/or Twitter account if you have one (as I have with Ben’s above), and of course you’d get credited in your real name (or as thebitingflea if you prefer) as well.